We introduce symbiotic expressions, a method for algebraic simplification within a compiler, in lieu of an SMT solver, such as Yices or the Omega Calculator. Symbiotic expressions are compiler-generated expressions, temporarily injected into a program’s abstract syntax tree (AST). The compiler’s normal optimizations interpret and simplify those expressions, making their results available for the compiler to use as a basis for decisions about further optimization of the source program. The expressions are symbiotic, in the sense that both parties benefit: an optimization benefits, by using the compiler itself to simplify expressions that have been attached, lamprey-like, to the AST by the optimization; the program being compiled benefits, from improved run-time in both serial and parallel environments. We show the utility of symbiotic expressions by using them to extend the SAC compiler’s With-Loop-Folding optimization, currently limited to Arrays of Known Shape (AKS), to Arrays of Known Dimensionality (AKD). 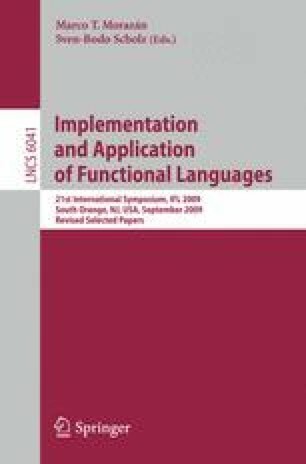 We show that, in conjunction with array-based constant-folding, injection and propagation of array extrema, and compiler-based expression simplification, symbiotic expressions are an effective tool for implementing advanced array optimizations. Symbiotic expressions are also simpler and more likely to be correct than hard-coded analysis, and are flexible and relatively easy to use. Finally, symbiotic expressions are synergistic: they take immediate advantage of new or improved optimizations in the compiler. Symbiotic expressions are a useful addition to a compiler writer’s toolkit, giving the compiler a restricted subset of the analysis power of an SMT solver.